John Costanza | The Fantastic Flame On! Hello, and welcome to episode 162 of The Fantasticast. Each week, Steve Lacey and Andy Leyland guide you through every issue, guest-appearance and cameo of The Fantastic Four. This week on the show, we’re covering Fantastic Four #138, featuring the return of three beloved characters last seen in the Lee/Kirby era. One is Johnny’s college dorm-mate, Wyatt Wingfoot. Another is Wyatt’s wannabe football coach and interesting plot-dodger, Coach Thorne. And the third is… uh… the Miracle Man. The Miracle Man and Coach Thorne. Just let those sink in. It’s not all bad, however, as Alicia experiences minute plot development, Johnny gets a reverse haircut, and Steve and Andy present the latest instalment in their irregular series, How To Speak In A New York Accent. Hello, and welcome to episode 157 of The Fantasticast. Each week, Steve Lacey and Andy Leyland guide you through every issue, guest-appearance and cameo of The Fantastic Four. It’s one the most packed episodes of The Fantasticast seen in a long time, with three comics before us. 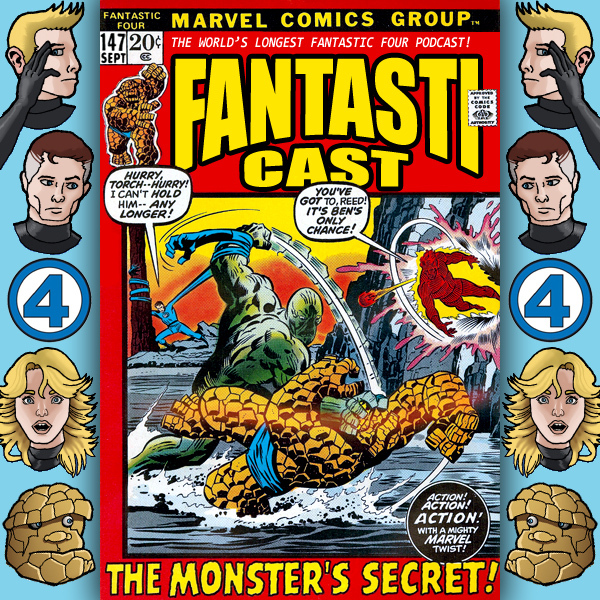 We start with Fantastic Four #134, with the return of the Dragon Man, and of one of the most unlikely Fantastic Four villains from the early 1960s. We continue with the legendary Luke Cage, Hero For Hire #9, in which Luke travels to Latveria to collect a debt of $200 from none other than Doctor Doom. Finally, Jim Starlin arrives to take over Captain Marvel with issue #26, guest-starring The Thing, and kick off the first great Thanos storyline. Hello, and welcome to episode 156 of The Fantasticast. Each week, Steve Lacey and Andy Leyland guide you through every issue, guest-appearance and cameo of The Fantastic Four. It’s a week of new beginnings for the Fantastic Four. It’s the first issue to be written by Marvel mainstay Gerry Conway. It’s also the first issue to be drawn by a woman, as Silver and Bronze Age legend Ramona Fradon provides fill-in pencils for this issue. And what pencils they are! Tundra’s back, and spoiling for a fight with the Thing on New Year’s Eve. We’ve got plots of mass destruction, foreshadowing for the climax of Iron Man 2, and someone literally attempting to turn back time. We’ve also got the unusual story of how Steve ended up partying with DMC (the clue’s in the title), and a moment of pure physical pain for one of the hosts. 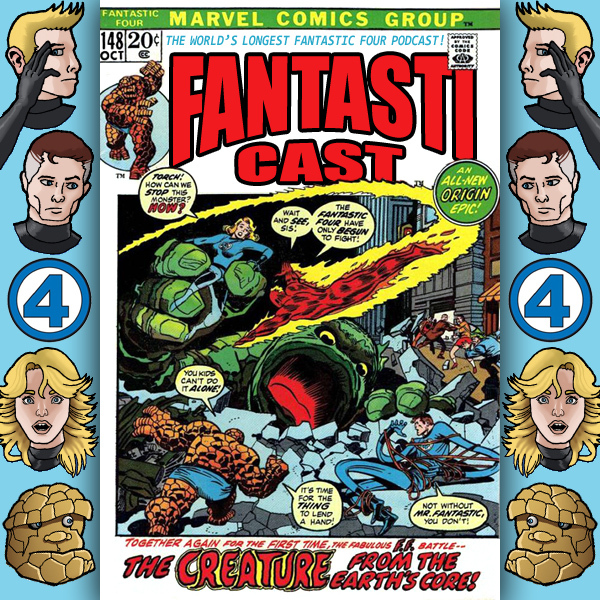 The Fantasticast Episode 155: Fantastic Four #132 – Omega The Ultimate Enemy! Hello, and welcome to episode 155 of The Fantasticast. Each week, Steve Lacey and Andy Leyland guide you through every issue, guest-appearance and cameo of The Fantastic Four. This week, we’re looking at Roy Thomas’s final issue of the Fantastic Four for a couple of years. It’s the concluding part of the two-part story pitting Crystal, Quicksilver and Johnny against the Alpha Primitives in the Inhumans’ Great Refuge, and big changes are in store for the team by the end of the issue. Costume changes, lineup changes, relationship changes, writer changes… everything’s changing! It’s a story of maturity, and a story of confused imperialistic themes and of misplaced audience sympathies. It’s also a story of Steve trying to tiptoe through the language of talking about this, with mixed success. It’s also a story of Black Bolt’s Coffee Shop, but that’s a very small part of the story. Hello, and welcome to episode 154 of The Fantasticast. Each week, Steve Lacey and Andy Leyland guide you through every issue, guest-appearance and cameo of The Fantastic Four. This week, we’re covering the first part of Roy Thomas’s final Fantastic Four story for a few years. John Buscema’s taking a holiday, so Ross Andru swings by to provide fill-in art for this story featuring Johnny Storm, Crystal and Quicksilver in the Great Refuge. The Alpha Primitives are revolting… and they’re not too happy about their status as slaves either! It’s an episode packed full of romance, fill-in art, the intentional immorality of Benjamin J. Grimm, existential links, discovering that Crystal doesn’t know how to kiss, and the revelation that Black Bolt is The Karate Kid. Hello, and welcome to episode 148 of The Fantasticast. Each week, Steve Lacey and Andy Leyland guide you through every issue, guest-appearance and cameo of The Fantastic Four. It’s the dawning of a new era for the Fantastic Four as Roy Thomas comes on board as the regular writer, with Fantastic Four #126. And what better way to start a new era than by revisiting the start of the previous era? Yes, it’s time to retell the origin of the Fantastic Four, complete with extra dialogue, homages to Jack Kirby’s panel layouts, and some alarming trousers. We also have an excerpt from the Power Records adaptation of this comic. The full audio and scans of the pages can be found at the Power Records blog run by Rob Kelly of the Aquaman Shrine. Do check it out! Hello, and welcome to episode 147 of The Fantasticast. Each week, Steve Lacey and Andy Leyland guide you through every issue, guest-appearance and cameo of The Fantastic Four.